Electrodeless Fluorescent Discharge Lamps, or EFDL, are the most energy efficient induction lamps available. With no internal electrodes we offer low lumen depreciation and a rated lamp life of 100,000 hours. Using optimized plant spectrums coupled with our Daylight Harvester’s automatic dimming control we bring unparalleled performance and savings to the greenhouse production crop grower. • Consumes up to 70% less power than comparable HID lamps. • Single lamp with broad PAR spectrum for vegetative thru flowering stages. • 100,000 hour rated with only 10% lumen depreciation @ 70,000 hours. • Unlimited Duty Cycle, switching and dimming do not reduce lamp life. • Consistent intensities and stable spectrum for repeatable crop production values. 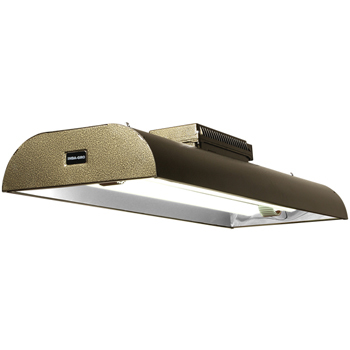 • Instant variable dimming from 100% to 50% output depending on varying sunlight conditions. • Power consumption is proportional to actual lamp output levels. • US service and repair center, 10 year prorated lamp and driver warranty. • May qualify as an accelerated tax deduction under the Energy Act of 2005 (HR-1424). • Qualifies for utility company retrofit rebate programs where applicable.